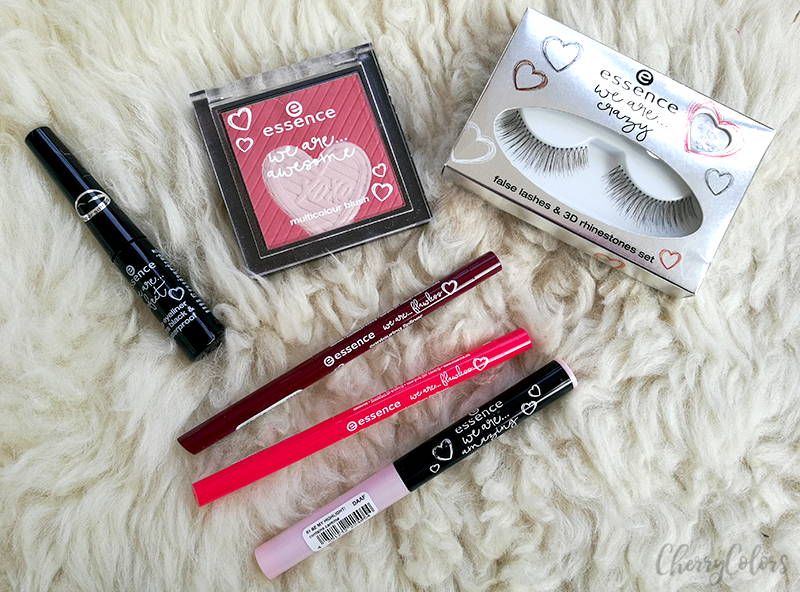 Essence We Are - Cherry Colors - Cosmetics Heaven! Essence came up with a friendship love themed collection that just hit our store shelves. together forever - with essence! Click to see the whole collection. To see what I think is worth buying and what isn't, check in the post below. This collection consists of 9 different products. I got 4 of them to play with. essence we are... amazing – creamy eyeshadow pen in 02 be my glam-light! just perfect. 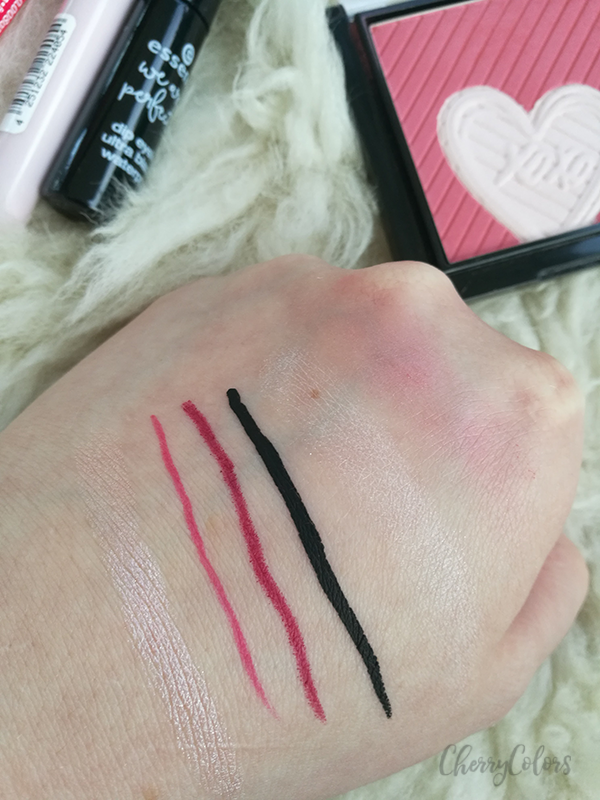 no matter whether you’re going for an expressive or subtle look, ultra black, accurate and waterproof eyeliner styles are easy to achieve with this dip eyeliner. I love essence eyeliners. Of course, I'm talking about their waterproof version eyeliners that are amazing for hooded eyes. Mine are hooded and oily and everything creases or gets smudged in a matter of minutes. But not this eyeliner. Once it's on, it's there to stay. Removal may be a little problematic if you don't use oils or oil based removers, but it's doable. I think this is one of the gems of this collection. absolutely amazing! the pen with a creamy texture creates beautiful eyeshadow styles in grey and light pink. can also be used as highlighter. I tried it alone, as an eyeshadow all over my eyelids. It left a slightly heavy/sticky feeling, but it didn't budge. Because I disliked the feeling I added a bit of powdered eyeshadow over it and it lasted the whole day without creasing. I have super oily eyelids that are hooded. Creamy eyeshadows don't usually work for me. Well, even if it lasted the whole day, I won't be using it as an all over eyelid eyeshadow, but I do like using it as a highlight for my teardrop. It looks amazing and it doesn't go anywhere for the whole day. If you're into highlighting your teardrop, this is the product for you. Essence we are... awesome – multicolor brush awesome! the multicolour blush in pink-coral with a heart embossment gives the complexion a fresh touch of colour. I had high hopes for this blush. The heart in the middle is lovely and all, but it doesn't work for me. It's not really pigmented, it is chalky and doesn't show up on my skin even if I apply a hefty amount of it. 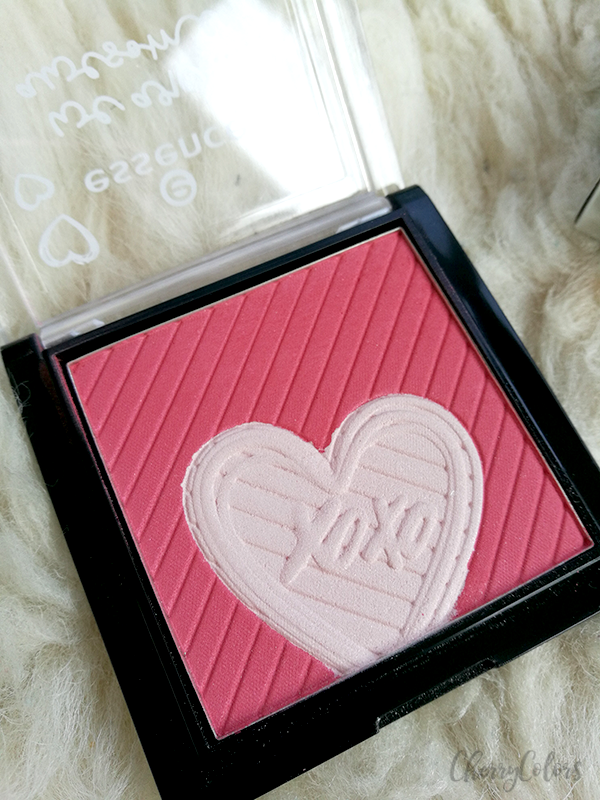 However, the blush part is lovely and adds a nice healthy look to your cheeks. But still, I wouldn't recommend it, just because the "highlighter" is worthless. crazy girls! 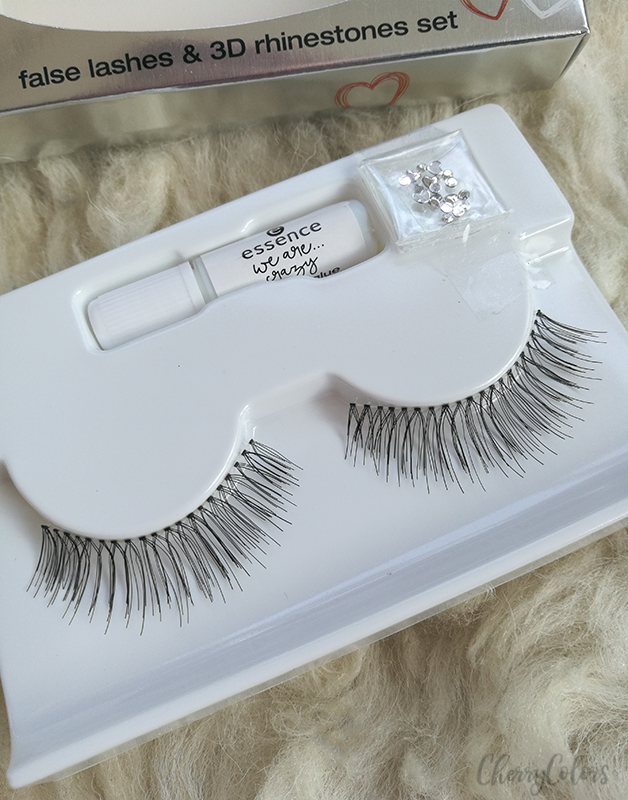 fake lashes ensure a breathtaking look and the tiny 3D rhinestones set individual accents around the eyes. The eyelashes look pretty natural, but huge on my eyes. The rhinestones are a fun touch and I admit that I still have to test these out. I can say that I like Essence's eyelashes, but I do know that most of the people don't. I am a fan of their single lashes. I think these are a fun way to open up your look and also add a bit of a bling to it. 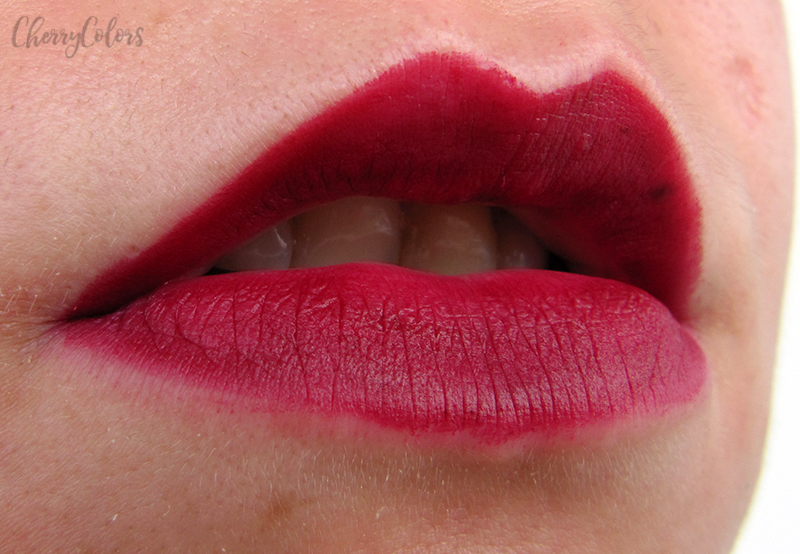 I received the lip liners in 2 colors - a deep berry and a pink color. Both are lovely and both have matte finishes. I don't have the lipsticks that come with them, but I feel that's not really needed anyway. The pigmentation is good and they are easy to use - they glide on the lips. I foud out that the automatic twist system works poorly because the liner tends to fall out. This happened with the berry color, the pink color just wouldn't really get back to where it should be and remained halfway out of its "case". Other than the faulty mechanism of the lip liners, they are lovely. Aren't long-lasting (as in won't survive nor eating nor drinking), but as long as you don't do anything, they are stress-free. This Trend Edition looks fun and all, but I didn't enjoy all the products I got. 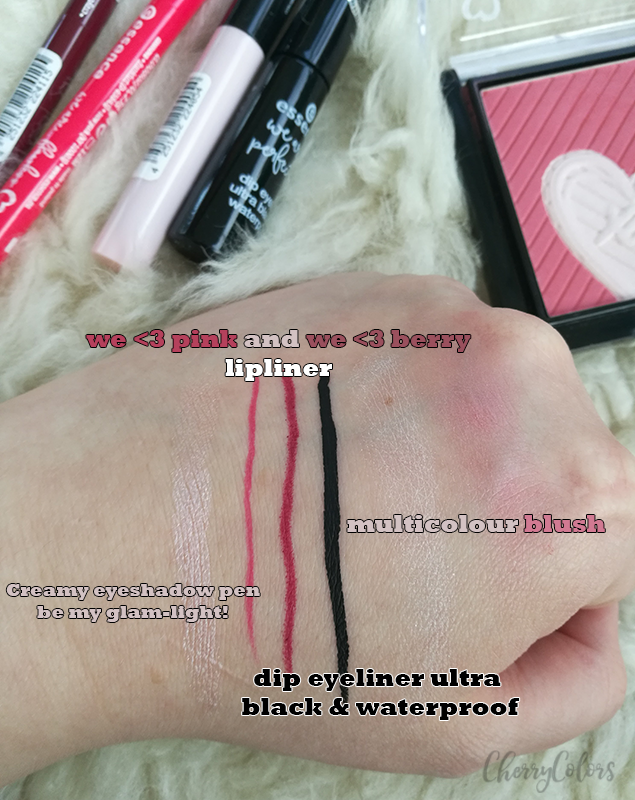 I liked the lip liners - mostly because how easy they are to use because they are nicely pigmented, the waterproof eyeliner is life and I will keep repurchasing it, if not this, then similar versions from Essence. The eyeshadow stick is something I thought I'd never use, but I found a purpose for it in my daily makeup routine and now I'm happy that I own it. If I had to pick just one thing for you to try from this collection then I'd say go for the eyeliner.